REGISTER NOW for our 2019 Dance Programme!
. . . and start FEELING, LOOKING & DANCING like a STAR!!! Discover the Passion of the Argentine TANGO, Caribbean Smooth Salsa, Bachata, Merengue, Zouk / Kizomba, Cha Cha, Rumba & Latin 3-Step and more . . . Dance Styles, Technique & Musicality . . . see "Class Programmes & Schedules" TABs for more! 1. REGISTER NOW for Certification Coaching Programmes (IDTA, ISTD, DIVIDA (Dvida), DanceSport, etc.) & Special International Certifications in Dance Studies for Dance Tutors, Schools, Achievers & more - (All Optional). 2. GOLD or PLATINUM CLUB Memberships available now and loaded with goodies . . . GIFT a MOM, DAD or FRIEND a lifestyle boost and escape - contact us to get yours! 3. We’re inviting skilled and seasoned dancers, tutors or groups wishing to join Stage Performance Teams, TDP & FTP Programmes or our Tutor, Coordination & Administrative Teams . . . Contact Us at (868) 627 4237, FaceBook, QUICK UPDATE Message Board. ABDA generally follows the Imperial Society of Teachers of Dancing (ISTD) and the International Dance Teachers Association (IDTA) syllabus with special focus on the Ballroom-Latin Dances. We add our special blend of Caribbean Flavor, Rhythm and Styling to the various CLUB-Latin Dances that transcend the basic levels set by the various certification and assessment bodies, to help students and tutors alike to develop a professional and achievement pathway to their desired goals. - Argentine TANGO, Latin Line-Dances. - Latin Hustle, Cha Cha (Amer./Club-style) and more. FTP Performance, TDP and Certification Training Programmes. Performers, Tutors, Trainers & Students can register for programme credits towards Assessment & Certification Programmes (Optional) as well as Dance Studies (Practicum) International Certification (UN) with CALDATT. Start FEELING, LOOKING & DANCING like a STAR! 4 Sessions Weekly (2 Class Days / Venues) - tt$350 /mth. REGISTER NOW for Certification & Coaching Programmes & GOLD or PLATINUM Memberships available now and loaded with goodies . . . GIFT a MOM, DAD or FRIEND a lifestyle boost and escape - contact us to get yours! FTP Performance, TDP & Certification Training. Inviting all Beginners & Adv. Dancers, Performers & Tutors to join the expanding programmes and opportunities . . . Looking forward to you joining the fun - Contact Us at (868) 627 4237 or FaceBook - see full extended dance classes schedule at Members Network. 1. REGISTER NOW for CLUB-Latin Certification & Coaching Programmes – for those wishing to Challenge Dance Certification Programmes in the coming period. 2. Can you Get Up To Speed and Ready For the STAGE & LIVE Performances??? . . . Get Ready for the Resurgence of the MAESTROS - the "Men in Black" . vs . the "DIVAs"
. . . Inviting Seasoned Dancers & Choreographers who are fearless, confident, skilled and ready to perform, compete, teach or simply excel and rise to the challenge of mastering 0-60 Performance Choreography in a broad range of dance styles . . . be a Performance MAESTRO or DIVA! . . . all welcomed.
. . . Performance & Choreography Training & Rehearsals . . . for interested dance enthusiasts, performers, groups, tutors and advanced dancers . . . so get on board now and be a part of live stage performances!
. . . B&L Performance Dances: Rumba / Latin 3-Step, Hustle, Salsa / Rueda, Cha Cha Cha, Bachata, Kizomba / Zouk, Argentine Tango & Latin Dance-Mix Performances! 3. FTP / TDP Performance & Tutor Training Workshops - REGISTER NOW! GOLD & PLATINUM Member Cards ($300) or Special PLATINUM PRO Membership - ($350) for qualified members. NOTE: Membership Cards remain current or valid for concurrent monthly class attendance. Any concurrent breaks will attract a card Renewal Fee. REGISTER NOW and select GOLD or PLATINUM Membership. So we have been learning from our students just as much as they have been learning from our B&L Dance Crash-Course and Dance Classes in general, . . . more importantly, we have been made aware that our "FREE-STYLE Dance Programmes" seem to now be categorized as it's own “Teaching Style”. Although this is a new concept to get our heads around (since all tutoring should at least follow some standardized technical or structural process), as we learn more from these shared class experiences, we are further amazed by the Eureka expressions when a previously learned dance sequence (or dance move) suddenly comes together, particularly for the more active dancers (i.e., those that have been dancing and attending other classes for some time). 4. Learning to Dance (our) “FREE-STYLE” FORMAT (‘Teaching-Style’) is about understanding 5 tenets - Rhythm, Timing, Execution, Lead & Follow. We believe, wrapped-up in these four (4) elements & five (5) tenets, are the key to learning all the various dance styles, moves and sequences to allow a fun experience and enjoyment for both you and your dance partner. Injecting the missing ingredients . . . we appreciate that the thought of “starting over” is a bit nerve-wracking, and although we can literally lay 100’s of “new moves” and "dance sequences" on our students, we are less likely to take this approach until the above elements & tenets can be appreciated and explored by new (& old) dance enthusiasts, beginners or experienced dancers. That being said, our class philosophy and focus is on ensuring that students have fun learning to dance and even more fun dancing in the first instance . . . and then can confidently enjoy dancing and executing all the new stuff they learned . . . so come join the fun . . . Cheers! - ABDA Admin. Thank You All for making it Memorable! 1. Thanks to the DJs for the Great Music and mood all night long! 2. Thank you for the Colours that kept the spirit and mood colourful and light! 4. To you our patrons and attendees whose feedback and enjoyment have been overwhelmingly positive and gracious! . . . and to the hard working crew who had to balance work and play all nite long . . . With LUV from ABDA! LET'S GET GET YOU STARTED! Thanks, we will contact you soon . . . Please complete your FREE Registration to our Members Area! BALLROOM & LATIN Dance Classes & Silver-Bullet (SB) Dance Workshops - THURSDAY EVENINGS: 6 - 8:00 pm. FAST-TRACK TDP, FTP & DF Stage Performers, Competition & Tutor Training (TDP) Workshops: TBA - 6 - 8:00 pm. Regular Ballroom & Latin Dance CLASSES & Silver-Bullet (SB) DANCE WORKSHOPS! BALLROOM-LATIN Class Sessions: Rumba / Cha Cha Cha / Mambo / Waltz / Swing / Jive / Samba / Latin Hustle. CLUB LATIN Class Sessions: Salsa / Mambo / Pachanga / Latin 3-Step / Bachata / CLUB Cha Cha / Merengue / Kizomba / Zouk. Tutor Development Programme (TDP) & Fast-Track Performance (FTP) Training Workshops. B&L TDP & FTP Workshops! Tutor-Development Program (TDP), Fast-Track Performance (FTP) Training & Silver-Bullet (SB) DANCE WORKSHOPS . . . SELECT YOUR MOST PROFICIENT DANCE Style/Combination! Are you ready to JOIN our ADVANCE PERFORMANCE TEAMS and show your talents in COMPETITIONS & STAGE PERFORMANCES? I am ready to TEACH, COMPETE & PERFORM on Stage! I think I may need some more classes and practice first! TUESDAYs - Port of Spain - 6:00 pm - 8:00 pm! CALDATT - Total Percussion Studio - #76 Henry Street (Upstairs Furniture Plus - opposite TSTT - B4 Duke St.), POS. THURSDAYs - Port of Spain - 6:00 pm - 8:00 pm! 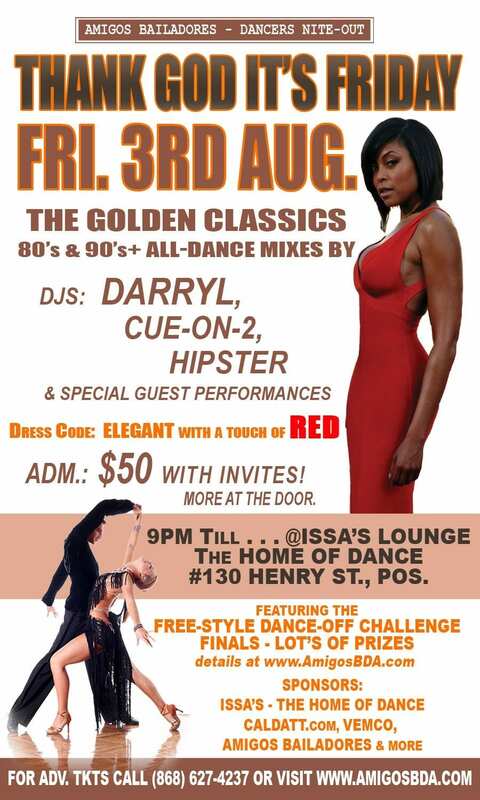 ISSA's Restaurant & Lounge, #130 Henry Street, POS (Above Park Street & B4 the Caribbean Court & RoyTec). TBA - Not Currently Available! Dance-Fusion Free-Style Performance Team & Stage Performance Training in various Cultural, Free-Style & Conventional Street Dance Styles. LATIN & BALLROOM Dance Performance Teams, FTP Workshops & Tutor Development (TDP) Training Programs! DancerSize® Fitness & Recreational, Health & Fitness Dance Aerobics Classes. I am UNDER AGE 16 and in good health. If you are under age 16 . . . Your Parent's Consent will be required to confirm enrollment. I am under age 16 and understand that my Parent's Consent is required for confirmation. Welcome to the Caribbean Dance and Fitness Programs of Caribbean Dance Explosion, Amigos Bailadores Dance Associates and Caribbean Fitness Inc. (CFInc), hereinafter collectively referred to as CFInc. This program involves the performance of a variety of dance styles, aerobic exercises, dancercise routines and other similarly strenuous physical activity. Please review our Terms of Service (TOS) below and upon your acceptance, proceed with the registration process. Assume the risk of and release and hold CFInc harmless for any liability for any physical or other injury or harm suffered by the participant during, or as a consequence of participating in, the program or performing such exercise routines or engaging in such other strenuous physical activity and agree that neither CFInc nor the facility at which the program is being held, nor any other person involved in organizing or conducting the activity shall have any liability or responsibility for any such injury or harm. You also acknowledge that the instructors who will conduct this program are independent contractors who were engaged by CFInc for this purpose, and that consistent with the instructors’ independent contractor status, CFInc retains no right of control over the manner or methods by which they conduct a program and is not legally responsible for their acts or omissions while conducting a program or activity. CFInc will have the right (but not the obligation) to film, tape, photograph, or otherwise record your participation in and attendance at the program; CFInc will own and have right to utilize all or any part of such film, photographs, tape or recording in such a manner as CFInc may determine without additional permission from or payment of any kind to you. Lastly, please know that your participation in this program also affords you membership to the CFInc Network with the opportunity to participate in benefit programs offered to members. We thank you for your registration and participation. "I certify I completely read and I accept the legal notice by validating this form"
Thanks, we will contact you soon . . . Please feel free to join our Members Area . . . FREE! LATIN & BALLROOM Dance Classes & Silver-Bullet (SB) Dance Workshops - THURSDAY EVENINGS - MARCH 2018. FAST-TRACK TDP, FTP & DF Stage Performers, Competition & Tutor Training (TDP) Workshops - Beginning FEBRUARY 15th, 22nd & 1st March 2018. North - Port of Spain - AVAILABLE for REGISTRATION! ISSA's Restaurant & Lounge, #130 Henry Street, POS. ISSA's Restaurant & Lounge, #130 Henry Street, Port of Spain. Get a FREE CLASS VOUCHER or SPONSOR a Friend a GIFT CERTIFICATE or EVENT TICKETS! . . . SELECT AND CLICK NEXT BELOW! GOLD CLUB Dance Programme MEMBERSHIP CARD / VOUCHERS - Monthly Subscription: (Discounts for 2+ CARD Purchases). Register for Ballroom & Latin Dance Classes! . . . SELECT ITEM and CLICK NEXT Below! PLATINUM CLUB Dance Programme MEMBERSHIP CARD / VOUCHERS - Monthly Subscription: (Discounts for 2+ CARD Purchases). GIFT A FRIEND a Class Voucher / Gift Certificate for ABDA Dance Classes for 1 Month. Get a FREE INTRODUCTORY CLASS - For 1st-Time or New Students . . . SELECT ITEMS and CLICK NEXT Below! Bring Along a Friend or 2 for a FREE CLASS - ON US - Available to Friends/Guests of Current Students! Get a FREE PASS for the Up-Coming Introductory Free-Style Dance Workshop! . . . SELECT ITEM and CLICK NEXT Below! BUY EVENT TICKETS (2 Tkts Min.) - BRING BACK DE OL' TIME DAYZ - 'IN LIVING COLOUR' - All-Dance Party Fund-Raiser! . . . GET SPECIAL DISCOUNTS WITH PURCHASES OF 5+ TICKETS OR MORE. Get a FREE PASS for the FAST-TRACK Performance (FTP) Dance Workshop! . . . SELECT ITEM and CLICK NEXT Below! THANK GOD IT's FRIDAY featuring the "CASH-POT" DANCE CHALLENGE FINALS & All-Dance Party Fund-Raiser and GET SPECIAL DISCOUNTS WITH PURCHASES OF 4+ TICKETS OR MORE . . . ! BUY EVENT TICKETS (2 Tkts Min.) - 'IN LIVING COLOUR II' - All-Dance Party Fund-Raiser! . . . GET SPECIAL DISCOUNTS WITH PURCHASES OF 5+ TICKETS OR MORE . . . until 28th April 2018. TICKETS: Buyer &/or Recipient Names | VOUCHERS: Buyer & Recipient's Name & Selected Dance Programmes (Ex. : 1 Month, 4 Class Sessions, 10 Sessions, etc.). I am OLDER than age 16 & in Good Health. I am UNDER or AGE 16 & in Good Health. If you are age 16 or less . . . Your Parent's Consent will be required. I am age 16 (or under) and understand that my Parent's Consent is required. Cool ... You're Done ... Now send us your details!